I apologize for the hiatus on my blog writing this month. I've been training extensively for the Parent Olympics. You see, I love the Summer Olympics. Mostly because it means my daughter can wear her 4th of July outfit more than once. But I am a rabid fan of the Parent Olympics, and this one doesn't wait every four years to come around. It's a daily event. You probably didn't even know you were training too. CeCe is a pretty tough trainer. She cuts me very little slack. Even during her nap time I have to practice Speed Cleaning. I know she's proud of me though. She expresses it through cuddles, which is definitely worth more than a gold medal. 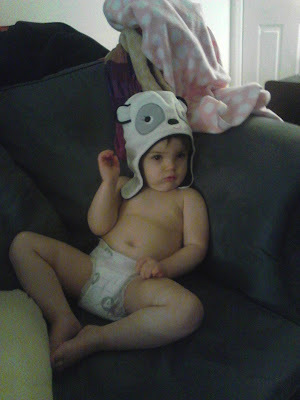 I'm thinking about incorporating the panda hat into our team uniform.